In 1948, doctors and medical researchers ventured into the Massachusetts suburb of Framingham to find some answers to public health questions that had been troubling them for decades. People across the country were dying from heart disease and stroke, but no one knew exactly why, or how to prevent the deadly events from happening in the first place. The team recruited 5,209 people between the ages of 30 and 62 to join their study. None of them had yet developed heart disease, which meant the researchers could begin to tease apart the individual factors that seemed to be correlated with developing heart disease as they got older. The researchers followed the study participants’ health for decades, eventually including in the study their children and grandchildren, to observe how heart disease makes its way through generations. Their research, dubbed the Framingham Heart Study, has become a giant in the world of epidemiology, the study of patterns of disease across populations. Its findings included breakthrough discoveries we now take for granted: that cigarette smoking, high cholesterol and blood pressure, as well as diabetes and obesity increased a person’s chance for heart disease, correlations that had never been made before. But today the pioneering study, which is still ongoing, finds itself on the fringes of a health care revolution. Instead of looking at broad populations to pinpoint trends within subsets of them, the medical world is increasingly turning to the individual, who can now be studied in higher definition than ever before. Precision medicine—the idea that treatments can be based on a patient’s unique biological and physiological characteristics—is gaining momentum. 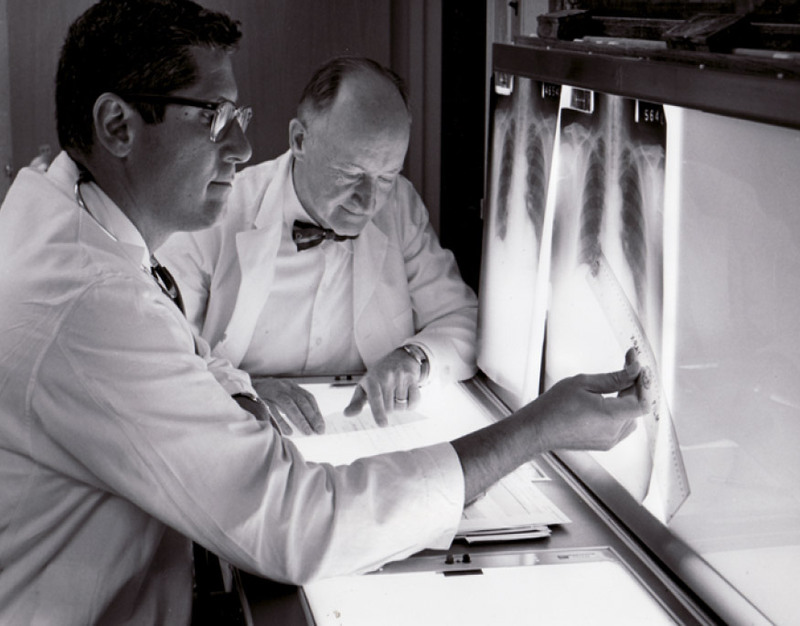 With the Framingham Heart Study, William Kannel, M.D., left, pioneered the idea that certain “risk factors” could lead to heart disease and that studying vast amounts of data might reveal what they were. A blood sample can already reveal the history of every virus that’s ever afflicted an individual. Likewise, a drop of saliva can help to monitor, diagnose, and regulate an array of diseases. Underpinning this new generation of breakthroughs is the emergence of nanotechnologies that can be fitted invisibly on or within our bodies. Many of them are connected to smartphones and connected networks, automatically transmitting blood pressure, heart rate, and glucose levels to researchers for an unprecedented, real-time look into the inner workings of our bodies. For now, these technologies are largely relegated to the research lab. But as these science-fiction-like discoveries continue to make headlines—and as external forces such as President Obama’s proposed $215 million Precision Medicine Initiative accelerate their development—they’re expected to reach clinics within the next few years. At that point precision medicine can truly disrupt evidence-based care. How we manage the impending deluge of data delivered by nanotechnologies will reshape how we manage public health, laying the foundation for its future much as the Framingham Heart Study did for generations past. 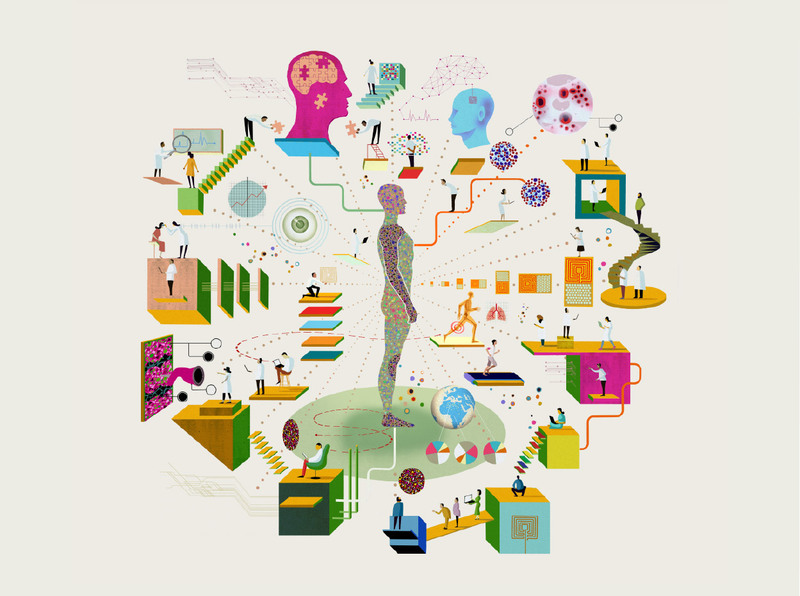 As we develop novel ways to miniaturize technology and customize it to analyze the health of individuals, these connected sensors will collectively paint a data-driven portrait of public health, and only then will precision medicine show its true promise. One of the most common blood tests is the basic metabolic panel—or the CHEM-7 test—which measures the levels of things such as glucose, blood urea nitrogen, creatinine, as well as four electrolytes: sodium, potassium, chloride, and bicarbonate. Physicians glean an enormous amount of information from this simple test, from how well the kidneys are functioning to how much sugar is circulating in the blood to the body’s response to different medications. But these tests are discrete, measured at specific points in time, often months apart, giving us a picture of our health that’s about as helpful as checking the weather three times a year to help you choose what to wear tomorrow. Heather Clark, Ph.D., an associate professor in the Pharmaceutical Science Department at Northeastern University, wants to monitor the CHEM-7 panel in real time. “If everybody had a continuous baseline of what healthy means for that individual, then small fluctuations [from] the baseline would be a predictor of illness,” she said during a recent interview. The current problem is that every time a doctor wants a peek into the inner workings of the body through the CHEM-7 test, they must collect vials of blood, which for patients is an inconvenient process at best and, at worst, an invasive one. Instead, Clark’s lab has developed a nanosensor that can be implanted in the skin as a sort of tattoo, which provides a continuous look into what is going inside the body, without the blood draw. Clark’s tattoo works because the sensors her team implants have a fluorescent tag that shines brighter or duller depending on the presence of each element in the CHEM-7 test. “The intensity of that fluorescence correlates to what we’re trying to measure,” she said. The researchers can track the levels of each element in the CHEM-7 by taking a picture of the skin with a smartphone equipped with a filter over its camera flash. The photo reveals what the eye can’t see and what a typical CHEM-7 test requires a full vial of blood to learn. Clark stresses that her results have been limited to animals thus far. However, she feels this technology is something that is attainable in the near future, possibly entering clinics in as few as five years. But that depends largely on funding. Its usefulness is not hard to imagine. Those who frequently use the CHEM-7 would benefit especially from the new technology—emergency room physicians, pediatricians who might find repeated blood draws in children difficult, and doctors treating patients in remote or rural settings. This new tattoo could mean doctors armed with only a smartphone would have a real-time snapshot of a patient’s health. CHEM-7 Test "Tattoo" A research team at Northeastern University has developed a nanosensor that can be implanted in the skin to monitor data in real time that would otherwise require a blood test. Meanwhile, using a different kind of nanotechnology, engineers at Johns Hopkins University recently developed a tiny machine that takes a swab of body fluid and processes it using what is called a “lab on a chip” device. “Basically, it’s a [device]—smaller than a credit card—that allows you to do things that currently can only be done in a clinical lab,” said Jeff Wang, a professor of mechanical engineering who leads the team at the university, during a recent interview. So rather than running several different steps to process a sample—to determine which bacteria are present and which type of drug will be the best treatment—Wang created a chip that does all of this at once. “Instead of waiting three days to figure out what the infection is and what’s the best drug to treat it, we believe our technology will deliver both answers within just three hours,” Wang said in a press release. The first step, identifying the type of bacteria in the sample, is already being used for patients at Johns Hopkins University, according to Wang. But, as with Clark’s CHEM-7 research, the second step—determining which drug works best in eradicating the infection—will take another three to five years to reach clinics. A microfluidic chip for bacterial detection and drug testing pioneered by Jeff Wang’s lab at Johns Hopkins. In 2013, a team of physicians and researchers at the University of California–San Francisco launched the Health eHeart Study, which updates the Framingham Heart Study for the digital age of smartphones and big data. The study seeks to enroll one million people around the world, equipping them with a suite of disposable sensors and smartphone tools, among other things, to create what is effectively a real-time data bank for cardiovascular research. By collecting massive amounts of data on every individual within the network—such as heart rate, blood pressure, and sleep and activity patterns, along with more behavioral data from online surveys—they believe we can crack the code behind heart disease, which still holds the infamous distinction as America’s leading killer. As of November 2014, more than 14,000 people from 32 countries have signed up to participate in the Health eHeart Study; this number, while far from the goal of a million participants, is nearly triple the number in the Framingham Heart Study. The new study is built on the world’s torrential adoption of smartphones and connected devices, which health care researchers like Olgin see as potential windows into the mysteries of the human body. About one in four people around the globe have a smartphone, but the emerging $1.7 billion market of the Internet of Things—the idea that everything from thermostats to pacemakers will soon be connected to the Internet with digital sensors—is laying the foundation for a new world of technology in which precision medicine can reach its full potential. for the age of the smartphone. WHEN YOU SCROLL THROUGH A LIST OF THE 49 BEST HEALTH AND FITNESS APPS OF 2015—apps that will track how far you walk, donate a quarter for every mile you walk, and reward you for those miles with digital weaponry to help you prepare for the zombie apocalypse—two things become clear: First, people are looking to technology, specifically their smartphones, to help them become healthier, and second, Silicon Valley is stepping in to help them do it. But while these health-focused smart apps might seem trivial, they’re the early, simple experiments in an emerging and transformative collision of mobile technology and health care. While step trackers rely on the simple GPS sensors embedded in every smartphone, other kinds of sensors, being developed in research labs across the country, can be worn on your body, embedded under your skin, or even swallowed to track everything from your heart rate to the emergence of cancer cells in your blood stream. But whatever these different sensors are doing, their underlying premise is the same: Capture data, analyze it, and help people act on it to be healthier. Mault leads a division within Qualcomm called Qualcomm Life, which wants to build the architecture that creates this new health care ecosystem of big data for patients, health care providers, and insurers alike. Qualcomm Life’s answer is a platform called 2net, which connects these sensor-driven devices—think an FDA-approved version of Fitbit—to a platform for health care providers who can act on the data in real time. Meanwhile, for most people, these new technologies will reorient health care with a more patient-centered approach, just as the health and fitness apps are already doing today. Rather than rely on a trainer for a personalized workout, you can now find an app to create one for you based on your preferences. Likewise, an embedded sensor may recognize shifts in the chemicals in your blood to alert your doctor to issue you a prescription, which you can pick up at the pharmacy within hours, before you’re even feeling ill.
Before that future arrives in full, however, we’ll see incremental progress as health care professionals learn to adopt these technologies and as the technologies continue to prove their utility to patients and providers. In the meantime, when most of us think about health and fitness technology, we’ll likely think of the curiosities we encountered on the 49 best apps of 2015. But as Mault, Valencia, and Qualcomm Life build a health care infrastructure behind the scenes, their vision for a smart, patient-centered health care system—one that helps us live longer, healthier lives, with fewer visits to the doctor and better delivery of the care we need—may arrive sooner than we expect. But while these health focused smart apps might seem trivial, they’re the early, simple experiments in an emerging and transformative collision of mobile technology and health care. While step trackers rely on the simple GPS sensors embedded in every smartphone, other kinds of sensors, being developed in research labs across the country, can be worn on your body, embedded under your skin, or even swallowed to track everything from your heart rate to the emergence of cancer cells in your blood stream. While the Health eHeart Study researchers are making do with existing devices like smartphones, and even early prototypes of wearable sensors, researchers such as Clark and Wang are still in their labs inventing the next generation of nanotech devices that will provide even more precise looks into our health. Their work might soon mean that people will be sharing not only traditional medical records with their doctors but also real-time biological data gathered from sensors implanted in or attached to their bodies. Such a system would be like the Health eHeart Study taken to its technological extreme, tracking granular metrics on any individual’s health in the network—and being able to cross-reference that with data from any other individual or group’s health in the network over time. Perturbations of chemicals in just a small drop of blood might be enough to trigger our personalized health care system, prompting us to see a doctor even though we look and feel fine, even delivering a prescription medication directly to our door. Enough perturbations in a similar population and doctors may find patterns—similar to the patterns found in the Framingham Heart Study—that unlock new treatments or cures to our most deadly diseases.